Many highly effective agents are available for the treatment of bacterial community-acquired pneumonia (community-acquired pneumonia) and other community-acquire respiratory tract infections (RTIs). Currently marketed antibiotics for community-acquired pneumonia demonstrate similar efficacy rates in clinical trials, and these agents have generally achieved clinical symptom resolution in 85-95% of trial participants. The drugs differ mainly in their spectrum of activity (the organisms against which the agent is effective), side-effect profiles, dosing schedules, and dose form availability. Broad-spectrum antibiotics are effective against a wide range of pathogens; narrow-spectrum antibiotics tend to be efficacious against a narrower range of bacterial species, generally either gram-positive or gram-negative organisms. TABLE:Mechanisms of Resistance Against Select Antibacterial Classes, 2004 summarizes the leading antibiotic therapies currently available to treat community-acquired pneumonia; TABLE:Mechanism of Action of Drugs Commonly Used in the Treatment of Community-Acquired Pneumonia summarizes the mechanisms of action of the major classes of antibiotics. IV = Intravenously; PO = Orally; qid = Four times daily; bid = Twice daily; tid = Three times daily; qd = Once daily. US = United States; F = France; G = Germany; I = Italy; S = Spain; UK = United Kingdom; J = Japan. BMS = Bristol-Myers Squibb; GSK = GlaxoSmithKline. In general, public health officials and thought leaders have promoted the use of narrow-spectrum agents whenever possible to limit the development of antibiotic resistance. However, broad-spectrum agents are more commonly used because therapy is largely empiric and physicians tend to be more comfortable with broader coverage. Several types of measures are used to assess the efficacy of antibiotics in vitro and in clinical trials. In vitro, the minimum inhibitory concentration (MIC) is the minimum concentration of antibiotic required to inhibit growth of a bacterium (also used to measure decreased susceptibility to antibiotics). In clinical trials, the clinical response rate, clinical success rate, or clinical cure rate refers to improvement in subjective symptoms and/or objective measures such as chest X ray. Bacterial eradication rate refers to the elimination of pathogens in sputum and/or in respiratory tract samples. 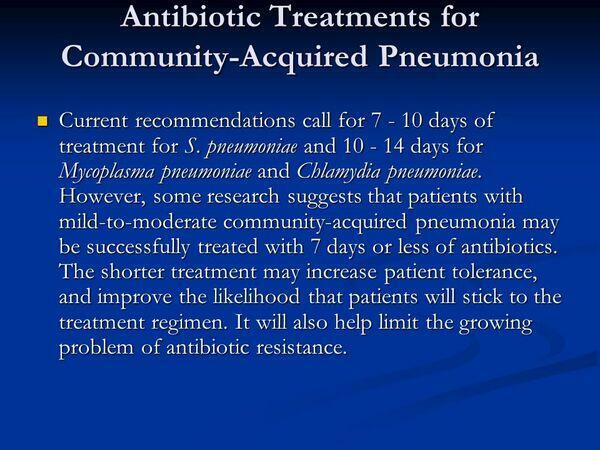 The choice of antibiotic therapy for community-acquired pneumonia is based on factors such as suspected etiologic pathogen, age and comorbidities, treatment setting (community or hospital), ability to comply with oral therapy, and severity of disease. Likewise, spectrum of coverage, side-effect profile, safety, dosing, drug interactions, and cost have an important influence on drug selection. Pharmacokinetics (e.g., absorption, distribution and tissue penetration, metabolism, and elimination) and pharmacodynamics (e.g., mechanism of action, rate at which a bactericidal or bacteriostatic effect occurs) have a direct bearing on clinical efficacy and can be important factors in differentiating an antibacterial agent in the minds of clinicians. Because many community-acquired pneumonia patients must be hospitalized, an important product attribute is availability in oral and intravenous (IV) forms. Ideally, products should have high oral bioavailability so that doses are interchangeable between the two forms. Products with high bioavailability allow physicians to prescribe oral doses confidently because they can be sure of achieving high serum concentrations. Agents with high bioavailability and IV and oral formulations are also beneficial in the hospital setting because they can accelerate IV-to-oral transition and hospital discharge. In recent years, the rising prevalence of drug resistance in the community has begun to influence prescribing choice by heightening concerns about antibiotic overuse and misuse (discussed further on). Likewise, health care costs play an increasing role in physician choice of antibiotic. An antibiotic's ability to kill a pathogen (bactericidal activity) or to inhibit its growth (bacteriostatic activity) typically depends on the organism involved. In the presence of a fully functioning immune response, a drug will help to cure the infection by inhibiting the growth of the infecting organism. When host defenses are lacking (i.e., in immunocompromised patients such as AIDS or cancer patients), or when the infecting organism is protected from the immune response (e.g., by a polysaccharide capsule), curing the infection depends almost entirely on the drug. In such cases, therefore, bactericidal activity is required.